Complete Professional VL SET Airbrush Kit with Master TC-20T Air Compressor, 12 Color US Art Supply Airbrush Paint Set and Accessories. Includes Master's How-To-Airbrush Manual. Versatile system is ideal for multiple uses: hobbies, crafts, fine art, nail art, temporary tattoos, cake decorating, sunless tanning, cosmetics, auto-motorcycle graphics & more! The VL Airbrush Set with 3 Tips and Braided Airbrush Hose. Common applications include hobby, craft, automotive, t-shirts, taxidermy, ceramics, cake decorating, tanning, tattoos, etc..
Professional Master TC-20T high performance single-piston airbrush air compressor with air storage tank and a air filter / pressure regulator. US Art Supply Airbrush Paint Kit with 12 Popular Acrylic Opaque Colors. Includes 3 in 1 Use Airbrush Cleaning Pot & Cleaning Solution, Paint Mixing Cup Kit, Airbrush Holder and How-To-Airbrush Guide Booklet. 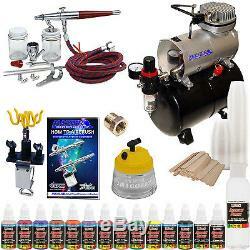 Paasche VL-SET Double Action Siphon Feed Airbrush. The VL airbrush set includes all three available spray heads, which allow the user to achieve fine lines down to 1/32" and wider patterns up to 1-1/2", so it can be used for most any application. Master Airbrush Air Compressor Model TC-20T. Professional high performance single-piston airbrush air compressor with air storage tank and a air pressure regulator with gauge & water trap filter. US Art Supply Airbrush Paint Kit with 12 Popular Acrylic Opaque Colors 12 Colors in 1 oz. Deep Black, White, Bright Yellow, Grass Green, Pure Pink, Bright Red, Deep Purple, Orange, Coffee Brown, Sapphire Blue, Hot Pink, and Flesh plus a 1oz. Paint reducer and both a 1oz. 3 in 1 Use - Airbrush Cleaning Pot. Paint Mixing Cup Kit: 100 - 1 oz. Plastic mixing cups and 50 mixing sticks. Universal Clamp-On Airbrush Holder: Holds up to 4 airbrushes. How-To-Airbrush Manual & Guide Booklet by Master Airbrush. We are an authorized dealer for all the product lines we sell. If a listing is for a particular item then that is what you will receive. If you do want to attempt to change an order or make an address change, it is best to call our customer service department immediately. Once you pay your order prints in our warehouse for fulfillment. If you have questions on how to do this, please message us first. We do not mark packages as GIFT. We reserve the right to select best option. UPS cannot deliver to P.
If this information cannot be provided then claim cannot be processed. In some cases we may not need to file carrier claim. Paint Products and DVD's are excluded from this guarantee. Defective claims can only be made up to 30 days after receipt of your order. Then send your item back to us with a copy of the original order. SPECIFIC ITEM EXCEPTIONS: PAINT & DVD's - If defective or damaged they will only be replaced. We must have picture documentation of damage emailed to us on all paint related items in order to authorize a replacement order or return authorization. This listing is currently undergoing maintenance, we apologise for any inconvenience caused. The item "Paasche VL SET Airbrush System Air Compressor 12 Color Paint Kit Cleaner Hobby" is in sale since Saturday, November 30, 2013. This item is in the category "Crafts\Art Supplies\Airbrushing".